For #MondayMadeIt today, I have a really cool DIY project I want to share with you. I picked them up at Michael’s when they were BOGO 50% off. Even still, they weren’t exactly cheap, but this was a project I’ve wanted to try for awhile. Since it is Christmas break and I have all of this time, I figured what better time than now to get crafty. 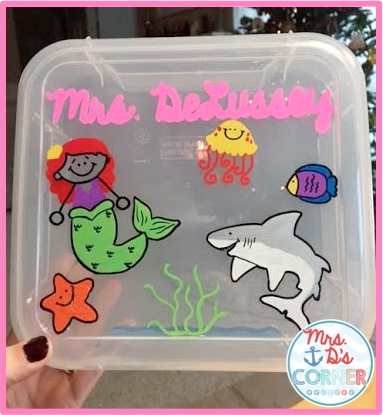 All you need for this project are the Sharpie Paint Pens and some clear, plastic containers. 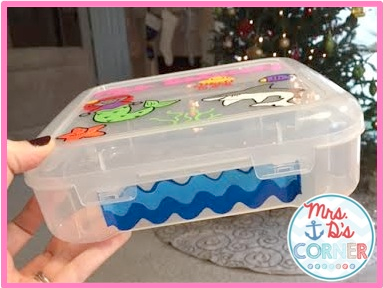 The containers can be any size or shape, but for this MMI post you’ll need to use clear ones. The Sharpie paint pens come in different point tips. The thicker ones I used were medium tip and the smaller pens are the fine tip. The first step is one that you need a computer for (unless you have super good drawing skills or are a calligrapher). 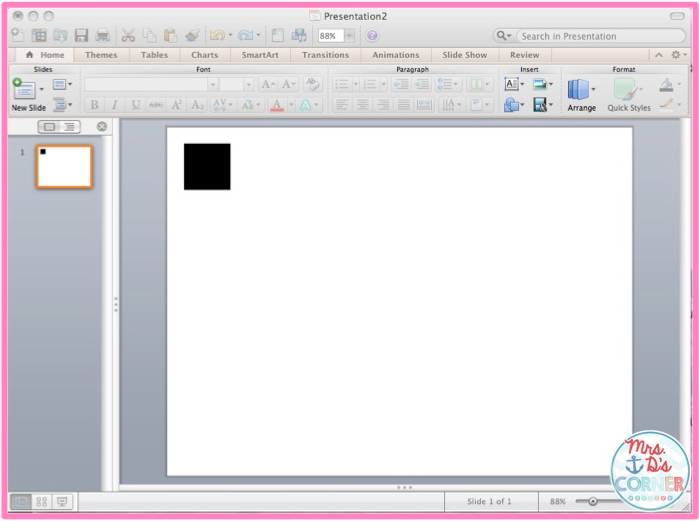 Open up PowerPoint, or whichever program you use to create. To keep my scale correct, I create a 1″x1″ square on the page I’m working on. I always seem to make things way bigger than they need to be, so this helps me make sure that my wording and clip art pictures won’t be ginormous when I print it out. If you only want to write your name in a pretty font, then you can just type what you want and print it out. 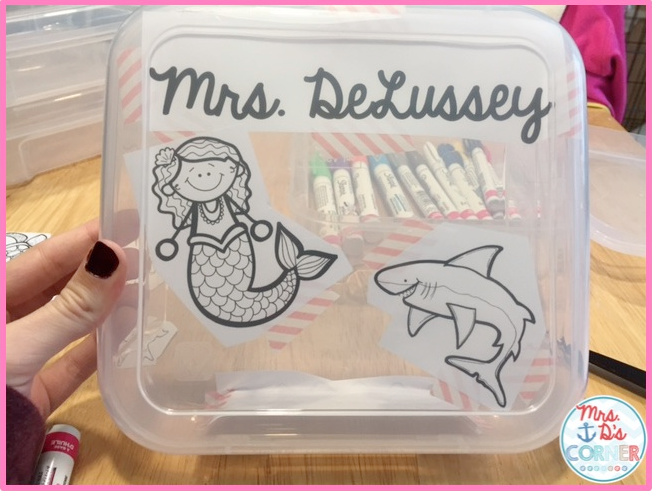 If you want to add cute pictures and things to your container, you’ll need to use the black line versions of the clip art. Since I am a clip art hoarder lover of all things clip art, I had a lot of designs to choose from. I went with an ocean themed box, since I love the beach. The nice thing about this is that you don’t need to make the page look cute, you just add and resize them on the page. I added way more than I could use, but I wasn’t sure exactly what I wanted to box to look like yet. Once you finish your page, print it out. Then cut out the pieces. Now you’ll need some tape. 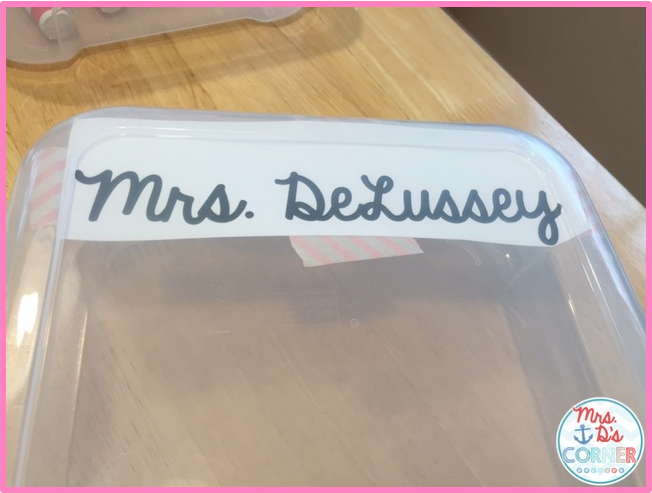 I used washi tape because it sticks well enough, but doesn’t leave the sticky reside on the container when I peel it off. I always start with the writing first. 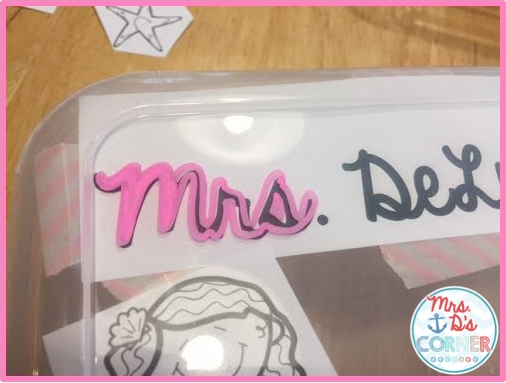 You’ll tape the paper on the inside of the box so you can write on the outside of the box. Then you can trace the writing. TIP: If you mess up during this part, try using a Magic Eraser on the paint pen marks. I’ve also heard that Expo markers will take off the marks. After the writing, I move onto the clip art. 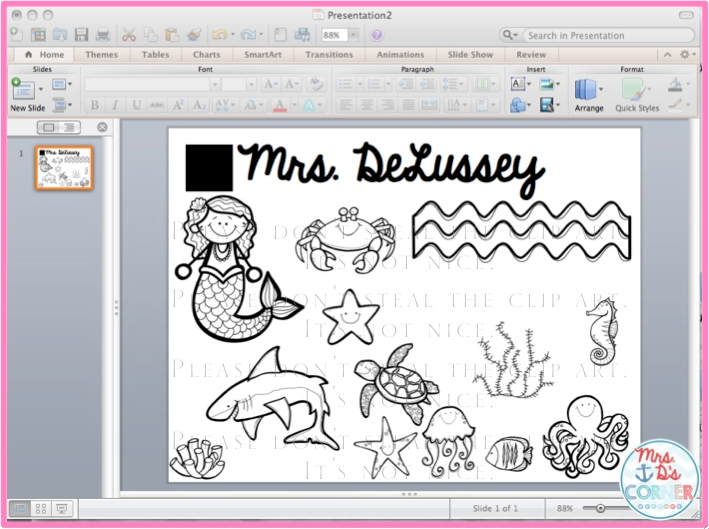 Now, there are two ways you can go about tracing and coloring in the clipart. For this project, I colored the main image first and then traced and added the layers in black. Take off the taped paper and that’s it! 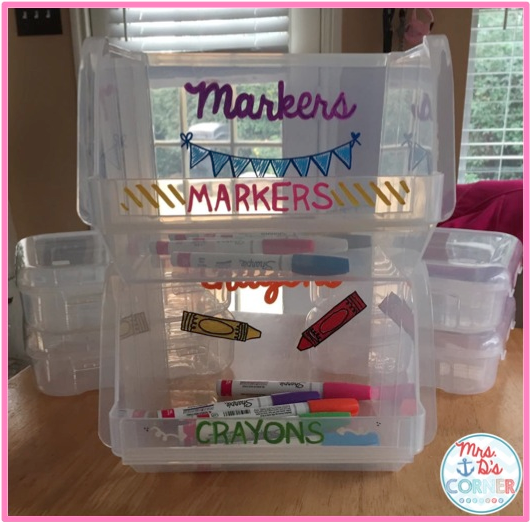 I also created these two bins for markers and crayons. 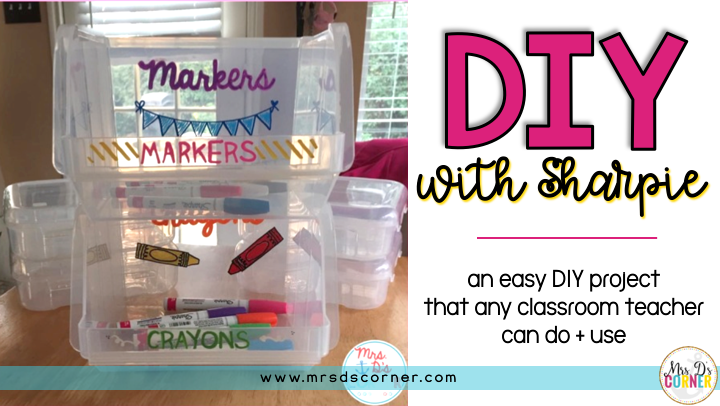 I picked the plastic containers up at Michael’s and the bins (shown above) at Office Depot. I purchased the Sharpie Paint Pens at Michael’s too. 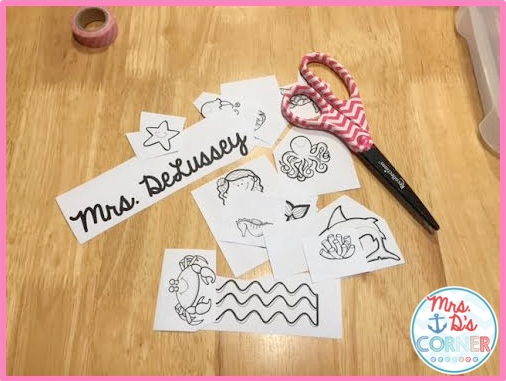 Clip art sets and fonts I used: Ocean Commotion by Krista Wallden, Mermaid Kids by Krista Wallden, KG Always a Good Time by Kimberly Geswein. 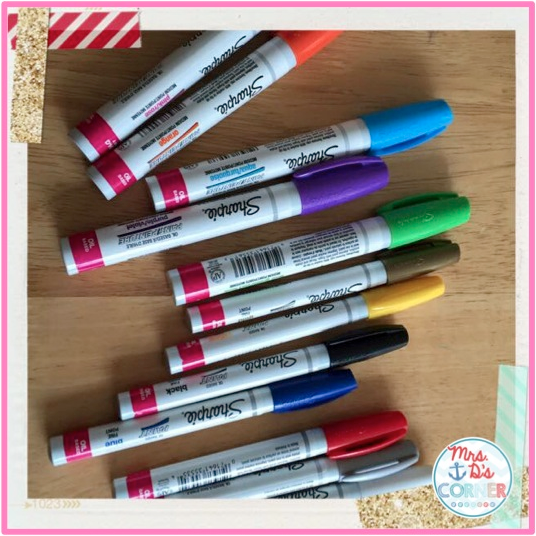 What would you use these paint pens for in your classroom? Tell us in the comments below!